The Dodgers came into today winners in four of their last five and seven of their last nine, with a golden opportunity to make it two straight series wins on the road against potential playoff competition. While they jumped out to an early advantage, just like yesterday the Phillies fought right back. The game went to 16th innings, which was too damn long, and eventually the Phillies walked it off on a Dodgers position player to win 7-4. Opposing starter Aaron Nola is like really good at throwing baseballs, so this was a tough matchup that the Dodgers offense was going to grind out, and that’s exactly what they did. 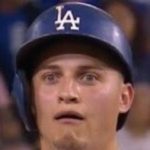 Joc Pederson slapped an oppo single to start the game in the 1st, and with two down a Yasmani Grandal pop-up seemed set to end the inning, but it dropped in for a single instead to put runners on the corners. That immediately cost the Phils, as Nola uncorked a wild pitch and Joc scored with a nice slide for an early 1-0 lead. After a bit of quiet time, Grandal continued one of his signature hot streak in the 4th, pounding a ball to deep right-center for his 15th of the year and a 2-0 lead. The bats continued to battle in the 5th with Alex Verdugo drawing a six-pitch walk to start, Kenta Maeda sacrificing him to second, and then Joc capping off a 10-pitch at-bat by skying a ball off the wall in left for a double and a 3-0 lead. Perhaps most importantly, Nola and his nasty stuff was forced to throw 91 pitches through five and was removed from the game. Grandal took advantage of that immediately in the 6th, this time bombing one from the right side to right field, his 16th of the year. That brings us to Maeda, and for the most part, he was just absolutely killing it against a quality lineup. He was perfect through 3.2 innings, only losing it on a quick-pitch attempt on an 0-2 count, allowing a single. The shutout was broken up in the 5th, with Nick Williams hitting a no-doubter to right, but Kenta used a nasty change to dominate for the most part. Primarily using the change, he struck out seven batters on the night. 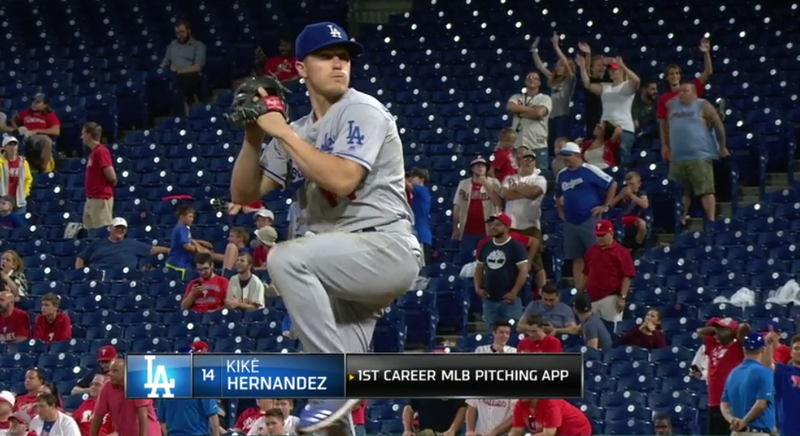 For the second night in a row, however, a Philly rally against a Dodgers starter went down. In the 7th, Kenta gave up a single and a double to score a run and make it 4-2, then with two outs gave up a game-tying dong to Jorge Alfaro. Maeda exited after seven with the game tied, allowing those four runs on just six hits and walking none. He pitched better than his line would indicate, but like with Ross Stripling yesterday, it’s why homers are devastating. As the offense couldn’t get anything going after the 6th, it was put upon the pen to keep things knotted. Scott Alexander certainly did his job in the 8th, getting a 1-2-3 frame with a strikeout. With Kenley Jansen being saved for a save, JT Chargois was brought on in the 9th and immediately allowed a double. After getting a bounce out to short, he was relieved by Zac Rosscup. The LOOGY did not do his job, as he issued a walk, and Dave Roberts went to Daniel Hudson. He allowed a line drive up the middle, but it was caught thanks to the defensive shift put on, and then escaped the jam by getting a grounder to third. Honestly, most of this game was evidence of the need for another quality relief option, even with relievers coming off the disabled list and starters moving back to the pen. If they had just one more reliable guy, they could’ve either had Maeda out of the game in the 7th before all that mess happened or wouldn’t have had to burn three relievers just to get three extremely iffy outs in a situation like that. Regardless, things continued on to extras, at which point Erik Goeddel was tasked with maintaining the tie. He got a relatively drama-free 10th, issuing a walk but otherwise acquitting himself well. Since the bats continued to be silenced, Goeddel was also given the 11th, and while he allowed a single he also got his second scoreless frame. Dylan Floro then turned in some outstanding work, starting in the 12th. He gave them 39 pitches and seven outs, allowing just one hit and one walk, striking out four batters. Finally, with one out in the 14th, Jansen entered and got out of the frame with a strikeout and routine fly out to center. He then came out for the 15th as well, starting with a strikeout, but surrendering a double and then issuing an intentional walk. However, he induced a grounder to first and got a strike out to end the frame. 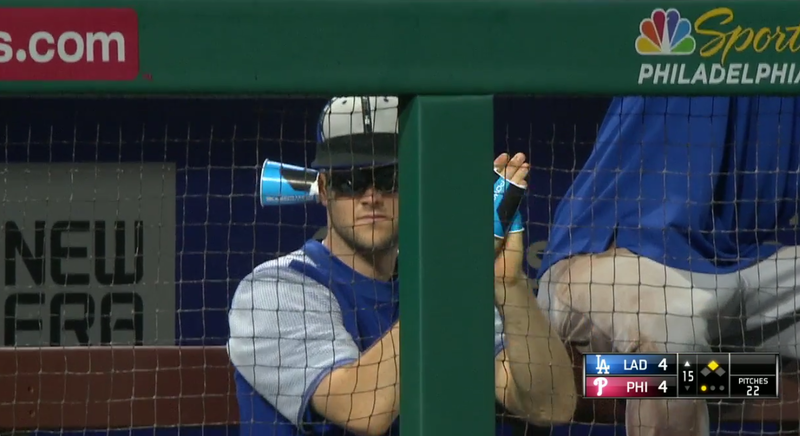 Enrique Hernandez got the 16th inning … yes, you read that correctly. Despite Rich Hill running out to warm up, they went with Enrique in his pitching debut. He got one out on one pitch, but then issued back-to-back walks to get in trouble, and then it was quickly ended on a fastball up that was hit for a homer. I don’t get it, honestly. It is annoying that they have like 20 starters and they just give up a marathon shitfest like this by having a position player pitch. Well at least we got this. The loss drops the Dodgers to 56-45, and the Diamondbacks get to within a half game of the NL West lead with their win. The rubber match will be played way too early tomorrow at 6:35 AM HST/9:35 AM PST/12:35 PM EST, with Walker Buehler being called up to face Jake Arrieta.